Reward players with more playing time when consistently attending practices. Follow instruction of the ref and XTSC staff. For example, if an opposing player is injured and they are playing short, take off a player as well. If a team is short players, match their amount of players on the field. This will ensure fair play and good sportsmanship among all players. Strive to allow equal playing time for all players on the team. Do not enter the field of play. If a parent enters the field of play, the game will be abandoned immediately and the team will receive an automatic 6-0 loss. Resolve any issues in a calm manner, one on one with coach or get a staff member involved. There is no tolerance for bulling or foul language. Attend practices in order to play during the gammes. Will provide a safe and fun playing environment. Explain infringements to the offending player when they occur. Does not allow and bullying or foul language on the field. Allows do-overs to contribute to the player's/team's soccer development. For example, if a player is injured and they are playing short, will ask the coach of the other team to take off a player as well. 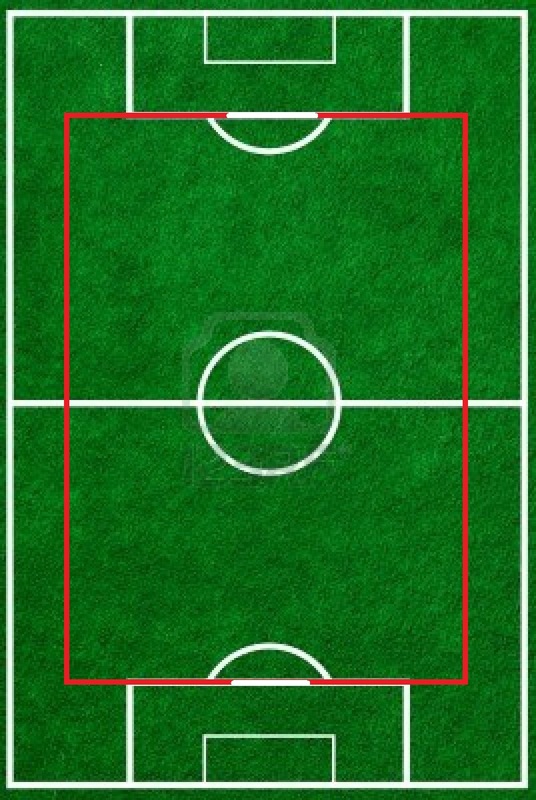 Dimensions: The field of play must be rectangular, field ratio of 3:1. A maximim of 1 field will fit on an 11v11 field. The goal area is 10 meters in length. The width is 24 meters, including the goal. The penalty mark is 10 meters from the goal. Portable 9v9 goals will be used. If a team has no substitutions the format will be changed to 8v8. Games will be forfeited if a team has 7 players or less. A scrimmage will be played instead of the game. The team that has the sufficient amount of players will receive an automatic 3-0 win. Substitutions can only happen after permission of the referee. Games are 2x30 minutes long, this includes half time. - The kickoff can only take place on the referee?s signal. - The ball can be brought back into play by a throw-in. - A throw-in occurs when a player of the opposite team touches the ball last and the ball rolls over the side line. - The opponents of the team taking the throw-in must be at least 5 meters from the ball until the ball is in play. - All other FIFA rules apply. - The ball has to be kicked in from the ground. - There is no retreat line for this age group. - A corner kick will be taken when a player of the own team touches the ball last and the ball rolls over the goal line, provided that it is not a goal. - The ball has to be touched by another player before the kicker can touch the ball again. - The opponents of the team taking the kickoff must be at least 5 meters from the ball until it is in play. - Goalkeepers are allowed to handle the ball with their hands within the crease. - After releasing the ball, the goalie cannot touch the ball again until another player has touched the ball. - Goal kicks are kicked in from the ground. - Players are not allowed to make contact with the goalie in the box. Not applicable for this age group. XTSC Referees will attempt to call all fouls and explain infringements to the offending player. - Kicks or attempts to kick an opponent. - Trips or attempts to trip an opponent. - Jumps at an opponent. - Strikes or attempts to strike an opponent. - Tackles an opponent from behind to gain possession of the ball. - Makes contact with an opponent before touching the ball. - Spits at an opponent. - Handles the ball deliberately. - Plays in a dangerous manner. - Impedes the progress of a player. - Prevents the goalkeeper from releasing the ball from their hands. - Commits any other offence, not previously mentioned. - Touches the ball with their hands after it has been deliberately kicked to them by a teammate. - Touches the ball with their hands after they have received it directly from a throw-in taken by a teammate. - Holds the ball with his hands for more than 6 seconds before releasing it from his possession. - Touches the ball again with his hands after he has released it from his possession. When a foul is called, the opposing team gets possession of the ball at the spot the foul was called through an direct or indirect free kick. It is at the referee's discretion to hand out Yellow and Red cards for a foul. A ref is also allowed to ask a player to take a break and substitute for another player without handing out cards. A referee may request any player or observer to leave the game facility when they are threatening the safety and enjoyment of players/referees. If the individual does not exit the area, the game will be abandoned and the team they are associated with will be penalized with a 6-0 default loss. Further action may be taken by the league pending on the incident review. Spectators, or any other people who do not fit into the player, substitute or substituted player category will be asked to leave the premises if they are causing any disruption to the game. A player who commits a cautionable or sending-off offence, either on or off the field of play, whether directed towards an opponent, a teammate, the referee, an assistant referee or any other person, is disciplined according to the nature of the offence committed. - Dissent by word or action. - Any offence committed recklessly. - Delaying the restart of play. - Failure to respect the required distance when play is restarted with a corner kick, free kick or throw-in. - Entering or re-entering the field of play illegally. - Deliberately leaving the field of play to mislead the referee and opponents. The offending player will be removed from the game for 5 minutes. The team will play a player down during that time. When the team in power play scores, the carded player is permitted back on, ending the penalty of playing a player down. 3 Yellow cards in 1 season will lead to an automatic suspension of 1 game. 5 Yellow cards in 1 season will lead to an automatic suspension of 2 games. - Spitting at an opponent or any other person. - Denying the opposing team a goal or an obvious goalscoring opportunity by deliberately handling the ball (this does not apply to a goalkeeper within his own penalty area). - Denying an obvious goalscoring opportunity to an opponent moving towards the player?s goal by an offence. - Using offensive, insulting or abusive language and/or gestures. - Receiving a second caution (yellow card) in the same match. A player, substitute or substituted player who has been sent off may be asked to leave the vicinity of the field of play. Ejected players must not interfere with play. If a red card is given, the player is ejected and the team will play a player short for the remainder of the game. If the number of players drop below the required minimum due to ejections. The referee will abandon the match and a win will be awarded to the opposing team. A direct red card leads to an automatic one game suspension for the following game. In addition, 250 points will be deducted from the player's or team captain's account. Yellow cards and red cards will be reviewed and XTSC has the right to increase/decrease suspensions, take further disciplinary action and/or terminate memberships. Members have the option to appeal any decision. This will not necessarily change the decision, but we are open to review and work with players. - Free kicks can be direct or indirect. - The opponents of the team taking the free kick must be at least 7 meters from the ball until the ball is in play. - According to FIFA rules. - The penalty mark is 10 meters away from the goal. That's It... Have fun... and Hey, let's be extra careful out there!